I’ve already written about the survival of the St Cuthbert Gospel (London, British Library MS Additional 89000), an eighth-century copy of the Latin gospel of John with its original binding, preserved in excellent condition because it was kept in the coffin of Cuthbert of Lindisfarne for centuries and afterwards treated as a relic. But the coffin and its history are at least as interesting as the book itself. London, British Library MS Yates Thompson 26, fol. 83r. Image: British Library. Take the activities of Alfred Westou, an eleventh-century sacristan of the church in Durham. 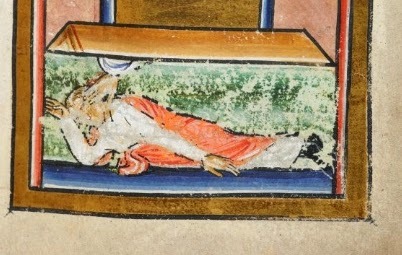 The monastic community of Lindisfarne had relocated to Durham in 995, bringing with them the coffin of their beloved saint, Cuthbert, and the reputedly incorrupt body inside. Astérix and Obélix. Image: the Indomitable Blog. One of the jokes of René Goscinny and Albert Uderzo’s Astérix comics is that the names of the two main characters, Astérix and Obélix, are typographic puns: the asterisk and obelus (also obelisk, thus a double pun referring both to the punctuation mark and to the menhirs that Obélix carries around) were used since Aristarchus of Samothrace edited Homer in the 2nd century BC. The origins and early use of both punctuation marks are described in a chapter of Keith Houston’s cheerfully readable Shady Characters: The Secret Life of Punctuation, Symbols, and Other Typographical Marks (2013), practically the only reasonably informative book in English about the history of punctuation since Malcolm Parkes’s more scholarly Pause and Effect: An Introduction to the History of Punctuation in the West (1993). For more about the obelus (which became the modern typographic dagger), read Houston’s book. Here I will focus on the asterisk.